The cradle of the Renaissance, the home of geniuses such as Michelangelo, Donatello, Brunelleschi and Galileo to name a few. The city has a population of about 500,000. It feels small and intimate. Much of the historic center is closed to traffic making it truly a living, walking museum. Sure it’s crowded, sure there are lines, but it has an elegance and sophistication that transports you to another time. Florence is loved by all. Florence is divided into four neighborhoods (quartieri) - Santa Maria Novella, Santa Croce, San Giovanni and Santo Spirito. Off the beaten path: Orsanmichele. It is quite possible that you will zip right by this treasure on the way from the Duomo to the Piazza della Signoria, in search of a cappuccino at Rivoire or a decadent Massimo Bottura lunch at Gucci Garden. Big mistake. This oft overlooked building is filled with fascinating history as well as gorgeous art and architecture. Built in the 9th century, its origins were as an oratory and it was then converted into a granary in the 13th century and eventually was consecrated as a church. Even before you enter the building, make your way around the exterior for a exhibit of statues created by the who’s who of the Renaissance sculpting world (Donatello, Ghiberti, Giambologna, Verrocchio). WAY off the beaten path: The Ferragamo shoe museum. A must stop on any fashionistas visit to Florence. Because, shoes. Opened in 1995, this little collection is a wonderful representation of the Florentine artisan tradition and the Ferragamo family business. Experience: 463 steps to the top of the Duomo. You can’t not do (of course, if you are claustrophobic or have a fear of heights, you may reconsider). What a view! Eat: pappa al pomodoro, ribollita, panzanella, bistecca alla fiorentina. These are all ultra traditional foods in Florence and I think you must try them all while in visiting (depending on the season). Many will also insist that a lampredotto sandwich be on the list but as I am not a fan of tripe (or innards in general) I can not speak to this. I will tell you that a truffle and butter panino washed down with a glass of prosecco at Procacci is just this side of heaven. Pray: San Miniato al Monte. In the late afternoon, take a walk across the river, through the San Nicolò district and up to Piazzale Michelangelo. Enjoy the view overlooking the city and then continue to San Miniato, perched above the square. In the late afternoon you will be able to take in the church in peaceful meditation while listening to the monks sing mass in Gregorian chant. Love: Farmacia di Santa Maria Novella - from the moment you enter through the enormous wooden doors of the building, you are greeted with an intoxicating fragrance that immediately soothes the body and mind. Here in the 14th century Dominican monks began to cultivate medicinal herbs and became the first to ever sell rose water ( a disinfectant used during plague years). The apothecary has been in continuous operation since then its shop opened to the public in the 16th century. The Farmacia now produces a line of home fragrance as well as perfumes and bath & body products. A perfect souvenir. Drink: Caffè Shakerato at Rivoire the epitome of iced coffee - an espresso poured over ice and shaken (not stirred) until icy cold and foamy, no dairy needed. Sure they offer caffe shakerato at bars throughout the city, but there is something downright decadent about drinking one at an outdoor table in Piazza Signoria while taking part in the very best pastime: people watching. Stay: JK Place - perfection. Ah, the Eternal City. How can you resist? Many people think that Rome is just a big city with all the big city annoyances - traffic, smog, noise, graffiti. Yes, it is all that but dig a little deeper and you will find quiet little neighborhoods, streets lined with colorful ivy covered buildings, small cafes and magical gardens when you least expect them. Don’t push Rome to the bottom of your list. Discover the Rome of the Romans, the Rome that goes way beyond the Trevi Fountain and the Coloseeum. The real Rome. Nearly 700,000 euros worth of coins are tossed into Rome’s Trevi Fountain each year. The proceeds are donated to Caritas to help those in need. Law in Rome allows cats to live without disruption in the place they were born. Don’t Miss: The gate in the Piazza of the Priory of the Knights of Malta on the Aventine Hill. You are in for a real treat when you look through the keyhole. Off the beaten path: Palazzo Massimo - The National Roman Museum. Most people never make the time to go to this incredible museum located near the train station. They have reconstructed a 1st c. BC triclinium (dining room) which was lavishly decorated with vibrant frescoes. It is an impressive collection of frescoes, statues and floor mosaics that is beautifully presented. WAY off the beaten path: My favorite catacombs are those at Sant’Agnese fuori le Mura. The church has a wonderful history as well as a vibrant and active community. It’s a beautiful place to visit and the complex includes not only the church and catacombs (which can be visited only with a guide) but also the little mausoleum of Santa Costanza, the daughter of Constantine. It dates back to the 4th century and contains a fascinating mix of pagan and Christian symbolism in the mosaics. The building was consecrated as a church (baptistery) in the 13th century. Experience: A concert at Bramante’s courtyard (near the Piazza Navona). Cacio e Pepe at Roscioli. Don't even think of coming here without a reservation! The Orange Grove located next to Santa Sabina is an added bonus when you visit. Pray: Santa Sabina, Aventine Hill. My favorite churches in Rome are definitely the Early Christian and this one is one of my all time favorites. I am not alone in this - it’s an extremely popular church for weddings. Don’t miss the original 5th c. column located in the right hand aisle, the original wood doors and alabaster windows (all dating back to the 5th c). The Turtle Fountain - true love! Rome truly has something for everyone. From modern art to classical music, from exquisite fine dining to mouth watering street food, from haute couture boutiques to bohemian artist workshops. Don't skip this city. If you have been, feel free to mention some of your favorite things to see in do in Rome in the comments below.. Everyone has a different experience. That is the beauty of travel. Random musings in no particular order (except alphabetical) - enjoy! Amalfi Coast - you think it’s passè, over done, too touristy? It might be all that in some ways, but honestly, you can’t skip it. It’s attracted travelers for decades for a reason. 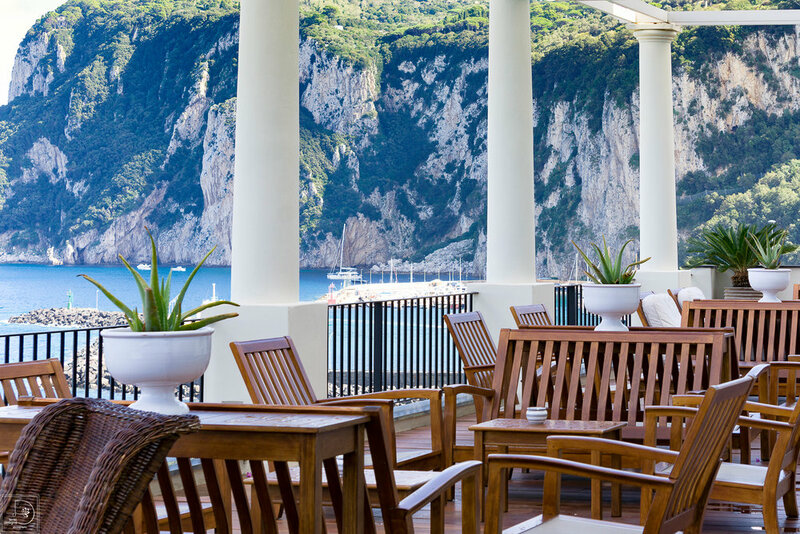 The Amalfi Coast (and Capri) seriously embody all that is la dolce vita. Gorgeous coastline, delicious food and wine, villages that are at once charming and elegant. There is so much more than the standard Sorrento, Positano, Capri tour. How about wine tasting in a cave at Marisa Cuomo winery? Hiking the Path of the Gods? Visiting the pampered water buffalo (from whence buffalo mozzarella comes) at the Vanullo farm in Paestum? Limoncello tasting anyone? Start with Amalfi. It’s never a bad idea. Cappuccino - drink them, liberally, but never after 11:00 am. Ask for it scuro if you like it a little stronger and ben caldo if you want something warmer than tepid. The barista does not heat the milk to a very hot temperature because Italians don’t wait around for something to cool off. Davide by Michelangelo. How can you not be impressed? I remember the first time went to Italy and I was itching to see the David. As I made my way through Italy several people commented to me that David was an extreme disappointment for them. Then I was conflicted: keep the image that I have of this magnificent sculpture in my head the way it is or risk being disappointed and judge for myself. I knew that I had to risk it. That was 28 years ago and I still vividly remember turning the corner at the Accademia and seeing that glorious statue bathed in light from above. It was breathtaking. So my advice to you - whatever it is that you think you want to see, do, eat….. do that. Don’t read reviews on TripAdvisor and make your decision based on the fact that Myrna from Nebraska thought there were too many crosses in the Vatican Museums or that Joe from Baltimore thought that the gelato at Vivoli was nasty. The only valid review is your own. And if you don’t go, you don’t know. Fritti - This is the generic name for fried things, be it fish, seafood, vegetables. Try the fried stuff in Italy. You don’t have to gorge yourself on it (though you might want to) but fried in Italy is very different from fried in the States. Some of my favorites: fried zucchini flowers, supplì and fried porcini mushrooms (decadent). Greve in Chianti - quintessential Chianti. Good food, good wine, a relaxed atmosphere that invites you in and begs you to stay. 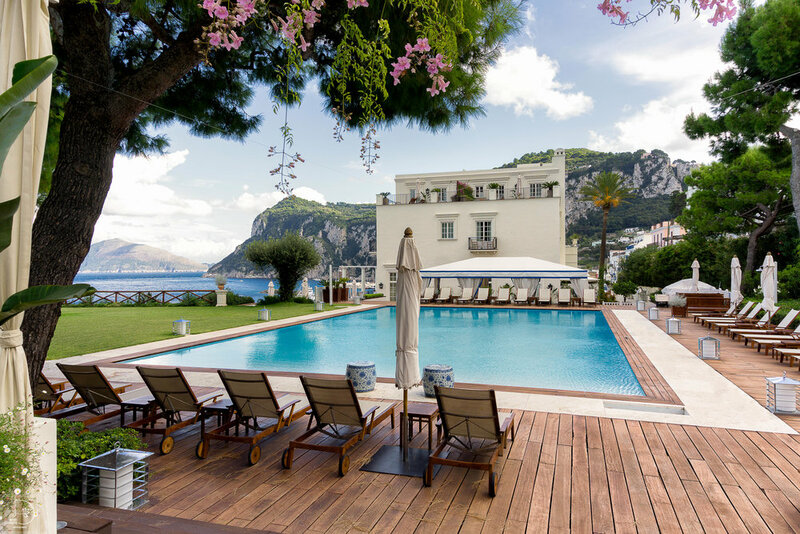 I love it here, most likely because it is home to one of my favorite hotels, Villa Bordoni. Help - Aiuto This word is useful. Italians appreciate a little effort with their language. Even if it is rudimentary (or almost caveman like), they will be more than willing to lend a hand. Investigate - meaning do your research. Hate big cities? Maybe Rome is not for you (even if everyone and their mother tells you should go). Afraid of heights? Skip the Duomo.Just make sure you are prepared before you go. Know what you are getting into. Of course there are always surprises (mostly good, I hope) but some advance planning on really does enhance your experience. So do your research. Or better yet, let me do it for you. Juventus - the soccer team. Sundays are not for church. They are for the true Italian religion: soccer. If you have the chance to see a soccer game in Italy, do it. It’s bigger than football, basketball, baseball and hockey combined. Soccer is life. Juventus is one of the perennial favorites in Italy. The team is based in Torino, one of two teams from that city. When two teams from the same city play a match, it’s called a derby. It’s like the subway series in NY and the sparks fly. Ka - a Ford car model in Italy. It is LITERALLY the only word I can think of in Italian. You see, there is no K in the Italian language - in fact, there are only 22 letters in the Italian alphabet. No K, W, X, Y.
L’Esperta - that’s me. Here for you and all of your Italian travel needs. Monumenti - there are beautiful churches, museums and statues in Italy. But then there are monumenti (monuments), that stand in glory. Like the Monument to Victor Emmanuel, also known as the Wedding Cake or the Typewriter. Oculus - the opening in the top of the roof of Pantheon. If you are lucky enough to be in Rome on the Feast of the Pentecost (Sunday, May 20 this year) you can experience the tradition of tens of thousands of rose petals being dropped in the Pantheon from the oculus, symbolizing the Holy Spirit’s descent to Earth. Pazienza - patience. You are going to need it. There is a different pace in Italy. On my last visit, I was waiting at the rental car office in Rome in a very long line. There was one older gentleman assisting customers. He was looking at a computer and clearly not trusting it at all because he then proceeded to write everything out by hand. At a certain point he announced to the people in line that he had to step outside to help a customer with his car. He proceeded to step outside of the office, stand outside in front of the plate glass window for all the waiting customers to see, and smoke a cigarette. Pazienza. Quartiere - neighborhood (in Florence, anyway). They are known as rioni in Rome, contrade in Siena, parocchie in Venice. Anywhere in Italy it is how the town is divided. There is a great deal of loyalty to one’s neighborhood - a concept known as campanilismo or loyalty to one’s bell tower. Reserve,reserve, reserve - get to know which museums, restaurants, activities require advance reservations and make them. You do not want to spend 2 hours of your day in line waiting to see the Last Supper or the Sistine Chapel. Life is short. Your vacation is even shorter. Plan accordingly. Sciopero - I hope you never encounter this one on your trip. It’s a strike and they can happen at any time - taxi strikes, bus strikes, airline strikes. Thankfully they are usually pre-planned and are over within 24 hours. Tabaccaio - a tobacconist shop which is also functions as a bus ticket distributor, a post office, a refreshment stop and a general “whatever you need we probably have it” kind of place. They are also easily identified with a sign with a “T” outside. X - I’m out of ideas here. Yes - say yes to everything. Do things you have never done before. Ride a moped, take a hot air balloon ride, learn about Etruscan culture, drink grappa, try wild boar (or tripe or sheep’s intestine). Step out of your comfort zone. This is how we learn. This is how we grow. zzzzzz…… sleep on the plane. Coming and going. But in between, sleep is for the weak. Italy has so much to offer and it is ever changing. The Rome you experience at 7am is a totally different city from midnight Rome. See it all, do it all. Just make sure you take a week off AFTER you get home. You will need a vacation from your vacation. The newest (though not new) trend in travel, is “off the beaten path” experiences. Somehow it has become almost offensive to visit major well known cities. Paris is passè, London is lackluster and Rome is routine. But you know what? There is no bigger mistake than skipping the big cities in search of a more authentic experience. Rome, Florence and Venice offer a base for understanding Italy. Of course they are touristy, of course they get millions of visitors every year. Guess what? There’s a reason for that. Rome, Florence and Venice are amazing, awe inspiring, fascinating. Each with its own history and culture that is palpable. Yes, there is something magical about small, off the beaten path villages, places where you meet the locals and get a feel for everyday life in Italy. But consider this: if an Italian was visiting the United States for the first time, would you insist that he or she forgo New York, Boston or Los Angeles for Schenectady, NY? You need a foundation, a base for understanding and the cities are a good start. They are the main course of the travel meal while the off the beaten path places are the side dishes and the dessert. And yes, while I too may enjoy the side dishes and the dessert the most, I know that it is not a balanced meal without the main course. The beauty of Italy is the rich, cultural diversity and that there is something for everyone. This also applies to its cities. Rome is Rome (Caput Mundi, the center of the Catholic world, the Eternal City), but it is also charming neighborhoods, gorgeous urban parks, innovative museums and so much more. Florence may be the Cradle of the Renaissance, but after the museums and churches, you can’t miss the fantastic food markets, the chic cafe culture and the amazing artisans that are making gorgeous creations in the Florentine guild tradition. Venice, albeit crowded, has a magical air. And once you move away from St. Mark’s Square, you can move through the city in virtual solitude, discovering wonderful back streets, tiny canals and charming locals who, despite their reputation, are actually delightful people if you only take the time to speak with them. If you live on the East Coast, I don’t need to tell you it’s cold. Talking about the weather is a useless endeavor. There is nothing we can do about it. But in our hopelessness, many of us feel that talking (bitching) about the freezing temperatures, the arctic wind, the drifting snow will somehow turn our winter wonderland into a tropical paradise. I, on the other hand deal with the cabin fever in a different way: I cook and bake up a frenzy. The biggest challenge is then getting all of the results out of my house with little or minimal damage to my perennial New Year’s Resolution to eat healthy. Believe me, the three boarders (I mean, kids) in my house are more than willing to lighten my burden, especially when they are all hanging around the house on a snowstorm. So yesterday was devoted to hunkering down with a puzzle, Netflix and some perfect cold weather recipes. As I have not fully bounced back from the holiday chaos coma, I was woefully ill-prepared for the impending storm. I did not race to the store for milk and bread (or anything else for that matter) so I was limited to pantry staples as a base for my creations. Enter the brilliant Carmela Sereno Hayes, a cook in England who has produced two glorious little cookbooks of some of the most authentic Italian cooking there is. Her first cookbook focuses on cucina povera , peasant cooking and it all comes from recipes passed down in her family. A couple of cans of white beans, some tiny pasta, a boullion cube and some pancetta and in less than 30 minutes you can have a delicious crock of hearty pasta e fagioli with a flavor that will seriously transport you to Italy. Grate some parmesan over it and serve with a crusty bread and some red wine - perfection. Stir well and add the tomato puree, red pepper flakes, basil and stock cube. Stir well and cook for 25 minutes. Add the uncooked pasta to the sauce 8 minutes before cooking is complete and cook until the pasta is al dente. Taste and season with salt and pepper. PS - there were also castagnoli for dessert. Decidedly not healthy but it’s all about balance, right? I checked into the Palazzo Bontadosi, a charming boutique hotel that opened in the main square of town in 2009. I love the modern vibe combined with thick stone walls and touches that give a nod to the town's rich history. Montefalco is called Umbria's balcony because of its position perched high above the plain of the Clitunno River. Five ancient city gates, each named for a different saint, lead into the city. The centerpiece (literally and figuratively) is the Piazza del Comune, the main square at the top of the hill. San Francesco church, a medieval church built in the 1300s, houses a sweet museum and a fresco depicting the life of Saint Francis, a masterpiece of Bennozo Gozzoli. Strolling the streets is a delight as there are lovely shops, boutiques and cafes but you also can't miss exploring the surrounding area. The wines here are impressive, particularly Sagrantino di Montefalco, and there are many small family wineries in the area that you can visit (some require reservations). You can also explore what is, in my opinion, one of Italy's loveliest regions: Umbria. Montefalco is a short, if windy drive to Assisi, Spello, Perugia and even Orvieto (a bit farther afield). I recommend it as a home base if only to have the excuse of eating at wine bar Alchemista every night. Memorable food, amazing wine selection and exactly what I want in a restaurant: low key, hospitable and delicious. I urge you not to overlook this very special town in Umbria. The beauty of Italy is that there is something for everyone. For some, Italy is the mecca of fashion, a source of inspiration and acquisition. For others, there is no other reason to go to Italy than to drink good wine and eat good food (there is nothing wrong with that). Then there are some (like the guy I share a bed with) who would be happy to never see the inside of another museum but could spend hours wandering through the streets of Rome marveling at the engineering feats of the ancient Romans. Of course you go to see the Sistine Chapel, the Colosseum, Michelangelo's David. All of these are masterpieces and impressive but at the same time, it is not the works of art alone that draw millions of visitors to Italy each year. The siren song that makes Italy so enticing is not what you see, but what you do while you are there. Immersing yourself in la dolce vita, embracing the lifestyle and beauty that is Italy and taking time to understand the people and the culture. These are the things that set Italy apart, that make it so alluring and irresistible. You don't go back to Italy year after year to see the Sistine Chapel one more time. You go for the unforgettable meal that you had, to feel the warm Roman sun on your face as you sit at a cafe sipping cappuccino. Here is a list of some amazing things to do in Italy that will take your trip from fabulous to exceptional. And finally....La dolce di far niente - the sweetness of doing nothing. This is what Italy is meant for: sitting in a cafe with a paper and a cappuccino, passing the morning away with absolutely no plan; strolling through the streets (la passeggiata) on a beautiful sunlit afternoon; lingering for hours over dinner in the company of good friends. Embrace the Italian way. You can see things when you are there, but you don’t have to see EVERYTHING. If you would like to add one (or all) of these experiences to your next trip to Italy, contact me and together we will create an adventure of a lifetime. A few weeks ago I made a trip home to upstate NY. Any excuse to get there for me is a good one but this time I was particularly intrigued. A dear friend had told me about a place that she insisted I must try. Dancing Ewe Farm had been on my radar for a couple of years but the timing just never seemed to work out. I was delighted when we were able to make a reservation for a fall weekend and looked forward to this event, even though I didn’t what to expect. Farm to table is all the rage these days and as such, some places are more successful at offering a quality experience than others. I have to say, The Dancing Ewe Farm exceeded my expectations. We headed north from Saratoga on a chilly Saturday afternoon. The drive was beautiful - no surprise as we were heading into the Adirondack state park. There is nothing more welcoming than the warm glow coming from a barn at sunset. Firepits crackled in front of the building as we all stood in awe of the sunset and the bucolic beauty of the setting. We wandered into the back of the barn where we were welcomed with a glass of rosè and squares of focaccia - nothing heavy - just something to whet our appetites for the meal that was to come. There is an order and process to the dinners on the farm - it may seem structured but it keeps everything running smoothly and without a sense of frantic chaos that can often happen when an event is not well organized. Rosè in hand we went to choose our wine with Luisa, the Italian half of the dynamic duo that own the farm. All the wines that the farm offers are carefully selected by Luisa herself. She is well versed in each bottle. There are several excellent bottles that are included in the price of your dinner (1/2 bottle per person) and there is also the option to choose from an impressive collection of wine upgrades. As we waited for the check in process to be completed we wandered around the barn, looking at the gorgeous products for sale - honey, olive oil, hot pepper spread, and the most gorgeous (and delicious) bread I have seen in a long time. I noticed that there were many paper bags at the table - many had already scooped up a loaf of bread to take home. I thought to myself that it was very gauche to sit through dinner with a large loaf of bread in a bag next to you. I came to regret that judgment as these people obviously knew something I didn't - there was not a spare loaf to be found once dinner ended. I was left with the memory of my the delicious crostini from dinner. A tour of the farm and explanation of the cheesemaking process preceded dinner. We listened to Jody, Luisa’s husband, speak passionately about the project that is Dancing Ewe Farm. Hard work, dedication and a belief in quality products was the takeaway. It is clear that Jody is truly committed to the farm and its success. We returned to the barn for dinner and were seated at a magnificent table that spanned the length of the building. And we feasted all’italiana. The antipasto was a work of art, showcasing small tastes of the various products made at the farm - a variety of cheeses, that sacred bread (I’m seriously still dreaming of it), various salami, balsamic marinated cippolini onions and more. The pace was slow, nothing was rushed. There was time to get to know your dinner companions and enjoy the wine. The second course featured a fall staple - pumpkin. Ravioli stuffed with pumpkin and ricotta in a butter sage sauce. It was true comfort food on a chilly September evening. There was more but I leave that to you to discover when you make a trip to Dancing Ewe in Granville, NY. Felt transported to Italy, if only for an evening. And that is never a bad thing. The tourist season is winding down in Italy. I have a few more clients heading to Italy in November and December, but for the most part I am closing the door on a very successful year. It’s been busy and I must say that I am ready to welcome some quiet time, but of course I will be looking to 2018 and creating more memorable experiences that highlight the best that Italy has to offer. I would like to take this time to thank all of the wonderful people who have put their vacations in my hands. Planning trips for people only rekindles my love for Italy. Every day I get see Italy with renewed excitement, from the perspective of people who may have never been there or from guests who are returning to Italy yet again because like me, they have found the country irresistible. We often take beautiful things for granted. We go through our day without noticing the gorgeous leaves changing, the glittery snowflakes, the way the rain makes everything shiny and new. Think about your own hometown. How many places have you left unvisited until you have house guests and then you wonder why you didn't visit sooner? When I arrived in Rome in 1990, I marveled at the nonchalance with which the Romans zipped passed the Colosseum, not even pausing to admire this 2000 year old architectural masterpiece. Fast forward 25 years and I often consider the amphitheater a nuisance, something that impedes my path from point A to point B. But thanks to my fabulous clients, I get to experience a new Italy everyday. I get to see the country that has become so familiar from a fresh perspective and with renewed enthusiasm. I love the first impressions of the majesty of Rome, the elegance of Florence, the kindness and warmth of the Italian people and the hair-raising adventure that is a ride on the Amalfi Drive. It brings me more joy than you can imagine. Here are some impressions that my clients have had of their trips that just make me beam. Jen meeting a woman who cared for her great grandfather - how special! I am honored to be able to share my love of Italy and the Italians with so many fantastic people. The greatest reward for me is learning that my clients have fallen in love with Italy as much as I did. There is nothing quite like that. That is success. Grazie mille to all of you. Some people are really good at making connections. Ann Nyberg is one of those people. One of her first thoughts when we met and I shared my love of all things Italian was to connect me with the folks at Jovial Foods. The link between me and a food producer in North Stonington, CT may not be immediately obvious (except that I love cooking and baking) but here is where the story gets even more intriguing. The owners of Jovial Foods spend most of their year in Italy and what they produce embraces the very epitome of the Italian philosophy of cooking and eating: only the simplest, highest quality ingredients. It is what I love most about cucina italiana and why I was absolutely enamored by Jovial Foods. The story gets even better. Jovial Foods collaborates with small local farmers in Italy who have agreed to grow einkorn, knowing that it is a less profitable grain but also appreciating the quality of the product and reassured by the guarantee that their product will be purchased by Jovial. The einkorn is milled in Italy, at a mill owned by a family that Carla and Ridolfo know personally. The same is true for the pasta factory- small family run business driven by personal relationships. These are fundamental in Italy andfor la cucina italiana. I had a fantastic visit with Heidi at the Jovial headquarters where I learned all about the company. They have been growing by leaps and bounds and recently moved from North Franklin to North Stonington. Their new office and warehouse are on the grounds of the historic Randall’s Ordinary Restaurant and there are plans to restore the property (one of the oldest homes in Southeastern Connecticut) and use it for exciting new ventures. In the meantime, Jovial is busy importing fantastic products (under the Jovial and Bionaturae labels) and offering week long programs in Italy to educate their attendees on cooking with einkorn flour and separate weeks dedicated to 100% gluten free cooking (their line of gluten free products is incredible as well). They also have a test kitchen with the Desi the recipe master at the healm, and their website is full wonderful recipes featuring their products. Feeling brave, I then decided to venture into baking with einkorn flour. The properties of the flour are different from those of your standard all purpose flour and take some getting used to. If you can’t get to the week long program in Italy featuring einkorn, I suggest buying Carla’s cookbook which takes you step by step through the process. Bread making is a process, one not to be rushed. This is particularly true with einkorn. The making of the starters is long and takes patience. It is important that you read through the process of making the starter as well as the entire recipe for the bread you are making before you begin. This is not something you are going to “whip up” for a pot luck in between the morning soccer game and the afternoon Girl Scout car wash. Advance planning is necessary but the process (for me anyway) is therapeutic and relaxing. I tried the whole wheat batard, with some success. I think the bread was denser than it should have been and when I wrote to Desi at Jovial she encouraged me to keep trying. She said it takes time to perfect. I plan on giving it another go soon. In the meantime, I moved on to baked goods that are included in the cookbook. The first thing that caught my eye were wine and olive oil biscuits. These wonderful little ring shaped treats are are something that I adore in Italy. They are not too sweet and the pure flavor of the olive oil and wine really do come through. I knew I had to make these. I learned to be patient with the dough because einkorn does not absorb liquids as quickly as other flours. Following the advice from Carla in the intro of the book produced wonderful results. 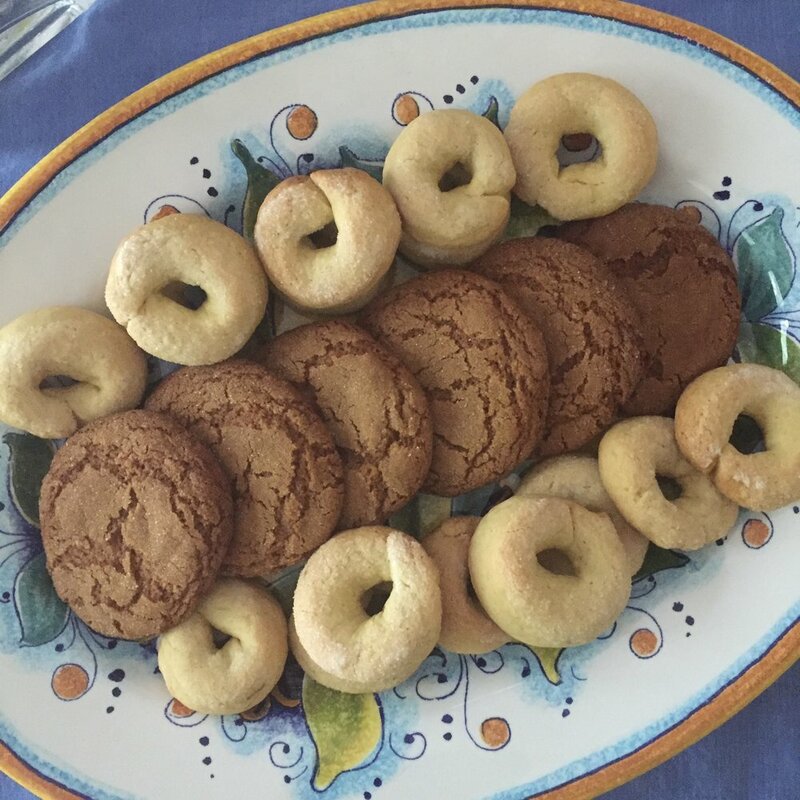 The wine and olive oil biscuits were perfect - they transported me back to Italy. I will only be making them when I am bringing them to someone as I can not be trusted with an entire batch in my presence. I also made the Ginger Cookies which were a huge hit in my house. I actually had to hide six of them in a closet so I would have them left for the picture above. Whether you are looking for a flour that is easier to digest or you are looking for Italian products of the highest quality, check out Jovial Foods - who knew this fabulous place was tucked away in my corner of the country? Thanks Ann Nyberg!!! Hospitality is an art form in Italy. The issue of tipping in Italy has become quite a challenging one in recent years. Years ago I was screamed and cursed at by a cigarette smoking, cell phone toting gladiator who stood in front of the Colosseum so that tourists could take pictures with an “authentic” Roman warrior. At the time, there wasn’t a set fee, but some offering (what I would call a tip) was expected. As we passed, my clients asked what sort of tip they should pay if they availed themselves of the gladiator’s services. I said 10,000 lire would be fine (about $5 at the time) and the gladiator seriously went all Russell Crowe on me, calling me unmentionable names and willing me to rot in hell. Apparently, his expectation was not in keeping with mine. The confusion comes from a clash of cultures. A country that does not traditionally have a tipping culture is visited by thousands of visitors coming from the US, a country whose service industry depends almost exclusively on gratuities. For years Americans have come to Italy not knowing the common practices in the country and tip as they would in the States. This raised the expectation for the service providers, some of whom would even get a little testy if the American standard was not presented. It became a crazy game of expectation and changing the rules depending upon the guest. Italy does not have tipping culture. It is not forbidden and you won’t offend anyone by offering a gratuity. A small token is welcome and appreciated but people in the service industry do not work for tips like they do in the states. The hospitality industry is considered a very respectable trade and skill and as such, the employees are paid a salary that is greater than what our servers in the US can expect. Italians do not tip. If they do tip, it is a very small amount, like a couple of euros for the table, if anything. It’s not that they are displeased with the service, it is just not their custom. So if you want to be “Italian”, then you don't have to leave a tip. The problem with this is that you are not Italian and the servers have come to expect tips from foreigners, especially Americans. I know, it’s tricky. Never overtip. A gesture is appreciated (see guidelines below) but if you move toward the 20% that is often expected in the US, Italians become uncomfortable. This is the land of hospitality, and although a server or a driver or a guide may be doing a job, they do so with great pride in their craft. Large, overly generous tips may be met with uncertainty and suspicion. Guides: The standard is 5 - 10 euro per person on a tour. Often times the guide is also invited to lunch or for coffee at the client’s expense. Is Positano on your "list"? Write it down and make it happen! Everyone has some sort of bucket list. As with anything, everyone does things a little differently. Some people choose to keep track in a journal or notebook or even a folder on their computer. Some call it a vision board or dream board. Others choose the more cerebral approach, keeping it all trapped between the ears. But regardless of the nature of the list, most bucket lists include (or are completely comprised of) travel. Unlike many bucket list items that farfetched and unrealistic, travel is completely doable. But you need a plan. Because we all know that time ticks away, days run into weeks, run into months, run into years. And that 50th birthday trip you were going to take? You’re about 7 years late. If this is the year you are determined to make it happen, grab that travel bucket list and follow these five essential steps. Get your passport and make sure it’s valid. you want to be ready when an opportunity presents itself. Passports take about 3 - 6 weeks to process unless you pay the expedited fees. Well in advance of traveling, make sure that your passport is valid for six months AFTER your planned return. This is a regulation that has been implemented in the past year or so for most European countries. Check out this website where you can check the specifics of the country or countries you plan to visit. You will not be able to depart from the US if your passport does not meet the validity requirements. Get real with yourself - Really, you must do this. Don’t do it because all the cool kids are doing it. Do it because it’s what you want. Do you really want to eat fermented shark in Iceland? If so, great! But if not, don’t. Your adventure is your adventure. And if that means a not so adventurous but incredibly indulgent holiday poolside with a fruity drink and not a care in the world, there is absolutely nothing wrong with that. You need to do what makes you happy, not what Instagram dictates is going to make you happy. Stay true to yourself. Get a jar - put money in it - Every single day. Even if it’s just a few quarters. Every cent counts and gets you closer to your dream. Do what you have to do to make this dream a reality. Put money aside,make coffee at home, skip dinners out for a few months, knowing that every plate of pasta you eat at home will mean a sublime dinner in a sidewalk cafe in Rome or Paris somewhere down the road. The sacrifice (if you want to call it that) will be worth it. 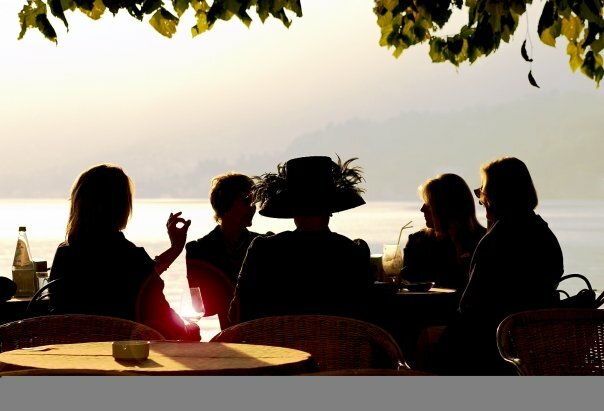 Get Together - meet with your fellow travelers and make a plan. The first step is to choose your travel companions. Perhaps it is decided for you - a family trip or a honeymoon for example. But if you are choosing people to travel with, think carefully about whether or not you are compatible in travel. Good friends do not always make good travel partners. It all comes down to travel philosophy- luxury or shoestring, run through and see as much as possible or slow it down and take in the atmosphere. you don’t have to agree on everything, but you do have to agree to compromise or to split up when the time is right. Decide what, where, when how much. Not everything has to be set in stone but a basic plan is important. Get to know the best resources - the internet can be invaluable but also overwhelming. It can also be misleading at times. If you are doing online research, make sure you are using reputable sites. If you do any bookings online, read the fine print very carefully. Hotel booking sites offer some great deals, but often the payment is immediate and non-refundable. A great savings if you are 100% sure that nothing is going to change. But I can tell you (from experience) that in the event that you cancel, you will NOT get your money back. When looking for great airfare, make sure you get a very clear picture about what is and is not included. Many airlines offer cut rate fares which are great until you add up everything that is NOT included: checked baggage can cost up to $75 a bag and their are much stricter enforcement on the size of carry ons. Another common practice now is to charge for every seat if you want to reserve in advance. Sure, you can wait until you get to the airport check in, but the likelihood of you being wedged in a middle seat in the back of the plane is pretty high. If you are fine with that possibility, than you can save the fee. The most important thing is to gather all the information before you make a decision, try to sort through the noise of the internet, and if you can, connect with someone who has experience in the area you are visiting, be it a friend, colleague or qualified travel agent. Planning is essential and can actually be a fun and educational part of the travel experience. And believe me, it really is the only way to make it happen. Is travel on your bucket list? Let me know in the comments where you want to go next and how you are going to make it happen. I can’t wait to hear about everyone’s upcoming adventures! I am an explorer. And some times exploration can be dangerous. And scary. Ok fine, my explorations are not quite as dangerous as those of Christopher Columbus or Lewis and Clark. Mine is the sort of danger that comes from zipping around hairpin turns in a Fiat and trying to stay on the road as you are blown away by the breathtaking landscapes that inexplicably include lush vineyards, tiny villages and soaring snow capped mountains all in one panoramic image. This was the recurring theme of my latest adventure as I made my way through unchartered (by me anyway) territory in the region of Piedmont. My ultimate destination was a new hotel called Réva that had just opened in fall 2016. After navigating several dozen hairpin turns and resisting the urge to stop at the numerous winery along the way, I found my destination which was unassuming at the approach. I followed the steep driveway down into the vineyard and came to a small complex of buildings - simple but charming, nestled in the middle of rows and rows of gorgeous vines. There is a sense of what I can only call freshness and optimism at this boutique hotel, probably thanks to the fact that the property is run by a small group of energetic young people. From the chef to the winemaker to the smiling faces at the front desk, the staff exudes warm hospitality and although I believe this word is vastly overused, they are in fact passionate about Reva, its wines, its cuisine, its hospitality and they are clearly committed to making a stay in this food and wine centric region truly unforgettable. The rooms are modern but warm at the same time, all decorated in soft earth tones of grey and beige. My room looked out over the vineyards. Some have a terrace but if not, there is a large terrace with seating for all guests to enjoy. After I checked in I joined Francesca who gave me a short tour of the cellar and an explanation of the philosophy of the winemaker Gianluca. This was followed up with a tasting in their tasting room. It was a ideal introduction to the region. After a trying day of driving and wine tasting, I was ready for the spa. Though small, the spa at Reva, like all other aspects of the hotel, is well thought out, providing the optimal environment for relaxation. I did not have time for any services on this trip but I did enjoy the steam room, sauna, hot tub and aromatherapy showers. A perfect complement to a day of touring in Piedmont. I thought my day could not get any better….and then I dined at the restaurant, FRE. In the expert hands of chef Paolo and his delightful staff, you can not help but feel pampered and indulged. The restaurant prides itself in km zero ingredients - hyper local and seasonal - so there is no way to know what will be on the menu. Local farmers and producers dictate what the ingredients will be and Chef Paolo works his magic. I don’t think anything they serve could possibly disappoint. From the homemade focaccia to the palate cleansing carrot sorbet, every detail was exquisite and delicious without seeming pretentious or stuffy. This is real food, coupled with an exceptional wine list. My only regret was that I only ate dinner there once. What impressed me most about this wonderful property was the care and attention to detail. The staff remembered my name throughout my stay. I dined alone in the restaurant and I noticed that my table was turned to face out to the whole restaurant so as not to feel isolated. Little touches like this are not expected but are certainly appreciated. One of the most touching moments I had was on my final morning at Réva. The hotel had been full over the weekend but somehow on Monday I found myself as the only guest. I arrived at the restaurant for breakfast expecting the usual gorgeous buffet. Instead, there was a table for one, overlooking the vineyard. Next to it was a table that was filled with all of the delicious treats from the buffet but on a smaller scale. One tart. A small plate of meats and cheeses, rather than a whole platter. Three boiled eggs. Two muffins. Granted, it was still enough for a small family but it was just for me. Massimo, the wonderful waiter who was taking care of me that morning welcomed me with the warmth I had come to expect at Réva. Then he said, “I think that being alone in a hotel is like a dream and I wanted you to have a very special breakfast. Please enjoy”. That is true hospitality and it makes me want to return to Réva again and again and again. Many thanks to Alessandro at Jo-In Tours for the introduction to this fantastic hotel. As with any holiday in Italy, celebrations mean food. Throughout the year, tasty treats are dictated by the calendar - panettone for Christmas, castagnoli for Carnevale, focaccia con uva to celebrate the grape harvest. As we prepare for the Easter weekend, Italians everywhere - both in Italy and abroad, a buying and or making colombe (dove shaped Easter cakes), giant chocolate eggs and pastiera Napoletana, all delicious goodies that will grace the Easter table on Sunday. This year instead of sweets, I am sharing a savory menu - pizza rustic or Easter pie - an egg pie stuffed with meats and cheeses. It is a perfect addition to Sunday brunch and is great leftover served for dinner with a salad. Happy Easter - Buona Pasqua! Brussels, Valrhona, Vienna, Switzerland, all claim to be THE place for chocolate, but let me tell you, they have nothing on the city of Torino. Chocolatiers in this royal city were first licensed to sell their products in 1678 - over 400 years ago. And since practice makes perfect, it is not an understatement to call Torino the Chocolate Epicenter of the world. Last month, I had the distinct pleasure to visit one of the foremost chocolatiers in the city with my gracious hostess Lucia Hannau of Turin Epicurean Capital. Guido Gobino is a master chocolatier like no other. While the chocolate business has been part of his family for decades, it was he who took the Gobino name to a whole other level, incorporating new technology while always respecting the time honored chocolate tradition that lives on in Torino. The day before our factory tour, Lucia brought me into one of Signor Gobino’s elegant boutiques in the heart of the city. The space was beautiful- wood carved display cases and brightly colored wrappings along with the intoxicating smell of chocolate made this stop a true feast for the senses. That aroma of chocolate in the air hit us again as soon as we got out of the taxi at the chocolate factory the next day. The Gobino factory is in a more remote part of town but it was unmistakeable that we were in the right place. As we waited for our guide Loredana, we sampled some of the goodies that were offered in the factory shop. My personal favorite (up to that point) were the dark chocolate eggs filled with raspberry cream. Delicious. Loredana came out to meet us in the shop and I immediately felt that warm sense of hospitality that had been a part of my entire trip. We were extremely lucky to get into the production area as the whole operation was in high gear in preparation for Easter. Goblin produces about 12,000 giant Easter eggs (an Italian tradition) per year in addition to the foil covered eggs and other treats for the holiday. But by special arrangement (thank you Lucia) we were able to see the entire production process from the grinding of the cocoa beans which is turned into cream of cacao, to the machine where the cream is massaged for 14 to hours to oxygenate it and then made into chocolate in various forms. The most famous of the chocolate produced in the factory is the gianduia, the little triangle shaped morsels that are flavored with hazelnuts, all thanks to Napoleon Bonaparte. In 1863 there was a shortage of chocolate in Torino as Napoleon blocked it from arriving to the city. The inventive chocolate makers of Turin knew the city could not go without its chocolate so they found a way to stretch what was available by adding hazelnuts, a product commonly found in the region of Piedmont. And thus the gianduia was invented, and it was the first wrapped chocolate in the world introduced in 1865. Signor Gobino’s gianduia has won best gianduia in the world four years in a row at the Salon de Chocolat. Our tour also included a stop to see the chocolate eggs being molded and wrapped as well as the much anticipated and always appreciated chocolate tasting. Pure decadence and pure bliss. Included in the tasting were three different kinds of gianduia, chocolate covered candied ginger, fruit gels covered in chocolate and much more. It was a tough morning of work but we had to do it, all in the name of research. You can take a tour of the chocolate factory from September to November, January to early March and May to June. The other times of the year are either too busy (Christmas and Easter) or, in the case of the summer months, the production stops as the temperature is too warm. You can always arrange a chocolate tasting at the boutique in Via La Grange, in the heart of the city. Many thanks to Loredana, Signor Gobino and Lucia for a delicious morning!